1. Select Administration from the Navigation Pane. Then select Named Printers from the Area Page under Setup. Enter the system password if prompted. 3. 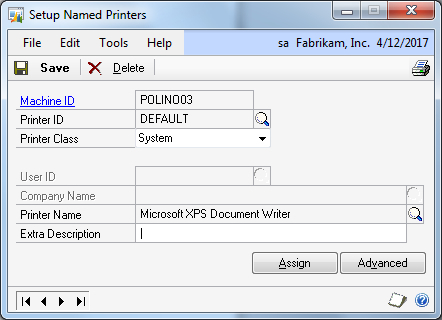 Select a default printer for Dynamics GP and click on OK.
1. Select Administration from the Navigation Pane. Then select Named Printers from the Area Page under Setup. 2. 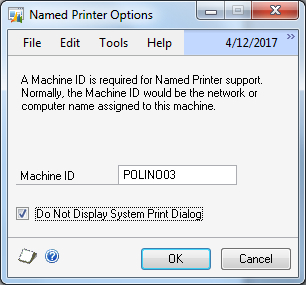 Notice that printers for this Machine ID can be set for a specific user and company. For now, we'll leave these alone. Change the Task Series to Purchasing. 3. Click on the blue Printer ID hyperlink to add another printer. 4. In the Task Description field find Payables Computer Checks/Cheques Printer. Change Printer Class to System. 5. 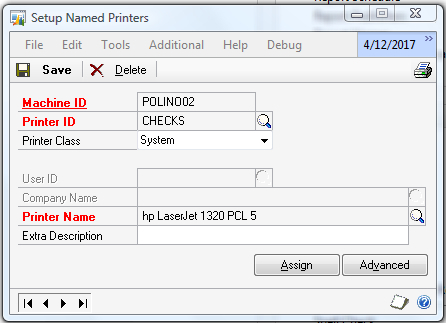 Select the printer named CHECKS in the Named Printers window that opens. When checks are printed via the Computer Checks function in Purchasing, from this computer and by this user, the checks will print to the designated check printer. Any other printer request combination will be sent to the default printer. Even more control is available via Printer Classes.